Online flight booking service Hipmunk released its iPhone app yesterday, and today the company took the stage at Launch to explain its pitch. The highlight: unlike most travel services that list flights by price, Hipmunk also calculates an “agony” rating based on a combination of factors, including the number and duration of layovers on the flight. Hipmunk says that there’s no reason to assume that a user won’t be willing to pay a few bucks more to avoid a six-hour layover in Chicago O’Hare airport. It’s a great idea, and the pitch was universally well received by the panel, which earlier slammed a presenter from Appconomy for having an unclear pitch and bland delivery. Most of the panelists voted it their favourite pitch of the five that were presented. VC Niel Robertson noted that Hipmunk solves one part of the agony equation — finding a good flight — but doesn’t actually let users book the flights. There seems to be an opportunity for a startup that actually replaces travel agents of yore and not only finds the best flights, but actually reserves them. Any startup takers? 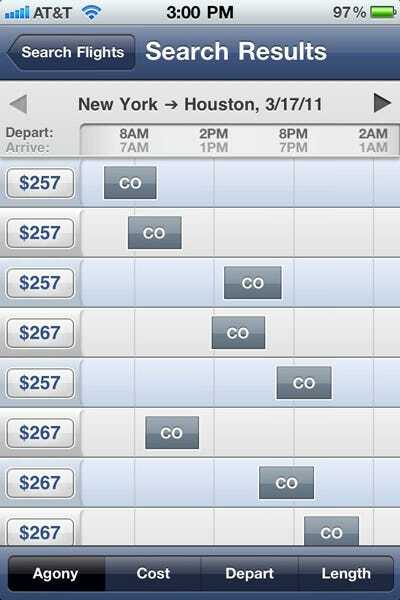 Now, don’t miss: Find A Super Cheap Flight With Hipmunk For iPhone.